By: Evelina Silveira, President Diversity at Work in London Inc. I hadn’t seen Jeff for over 30 years, since we had worked together as teenagers but somehow we recognized one another as he left the employment centre. Stopping to say hello, he recounted how he was recently laid off as a sales rep from a food manufacturer and was coming from a support group for mature workers. I hesitated for a moment and replied with: “ I can’t believe it Jeff, we are mature workers!”. “Wow, that makes me feel old and I really don’t understand why we would need a special group!” We both agreed that at our age we were really at our prime, having gained so much knowledge and skills. Why would these assets present such a dilemma for employers? I guess it has to do with how we perceive mature workers. Are all of those stereotypes really true? Cranky, bitter, burnt-out technology dinosaurs. This seems to be the basis for the majority of complaints. Are they really warranted? While working on an assignment with a call centre, I had a chance to test this out. I noticed first-hand why my client was unable to retain their mature workers. The rapid pace of the computer-training was too stressful and they quickly became disengaged, alienated and embarrassed by the younger trainees. I could see how it would have been beneficial to take more time in the training and “nesting phase” (time before you go live ). Spending more time on the front end would have actually saved on training costs and protect their reputation as an employer. Having a separate training strategy for mature workers would yield better results : creating higher retention and loyalty. Consistently, I saw mature workers quit before they were put on the chopping block. With three generations now working together for the first time, we must find ways to integrate them all for the survival of our organizations. It is estimated that approximately 41% of the working population is between the ages of 45 and 64 (up from 29% in 1991), and this percentage will continue to increase over the coming years. This is an astounding number we cannot ignore. It requires a new shift in workplace and societal attitudes challenging our perceptions regarding aging. Refrain from being overly judgemental about the younger generation’s work habits and expectations. Taking this approach will automatically distance you from them and this will only make you appear older and resistant to change. Look for opportunities where you can work with younger employees. Many younger workers often lament a lack of mentors in the workplace. Keeping an open-mind may make you someone they can turn to for advice. Conversely, they may be able to help you acquire or understand some of the latest trends that can be beneficial to your work –including technology and social media. Familiarize yourself with your rights and obligations as a mature worker. Recognize that in some types of jobs which require physical work you may notice a drop in your ability to perform. You may be asked to perform other work. Avoid getting pre-screened out of a job interview. Only include the last 10-15 years of your work experience and leave out the dates of your education except for recent courses. If you have 30 years of work experience listed on your resume, the screener can easily do the math! Be open to learning and taking any required professional development. It demonstrates engagement and your interest in staying with your job and being productive. Be honest about the kind of training you need and what approach works best for you. Many mature workers often benefit more from one-to-one or small group training over larger groups especially when it comes to learning technical skills. Avoid the temptation to parent your co-workers. As you get older there is an increasing possibility that your supervisor will be younger than you. Taking this approach will only work against you as it undermines their talents as a boss. Stay in touch with the language trends. If you don’t know what something means ask. Remember the language you use speaks volumes about your ability to adapt. Talking about the “good old days” creates exclusion. Challenge your own biases about ageing and ageism. Do you carry biases of your own that may prevent you from being your best at any age? Do you let biases about younger workers get in the way of promoting and hiring them? Age is increasingly referred to “as just a number” and you can be the inspiration to others who decide to remain in the workplace longer. Workplace inclusion can seem like an elusive goal. Does it really have to be that way? Whether you have a strategy in place, or take small steps with bolder ones along the way—it will pay off! Here are a few ideas, they don’t take a lot of effort and best of all you can start them today! 1. Add a voluntary self-identification check box in your application process. Who’s applying? Who is not? Self-identification will provide you with vital statistics for human resources planning. Case in point: if you start to see a pattern that only men are applying for a job, barriers could exist for women. This is worth investigating. Organizations are increasingly expected to reflect the communities they serve. Voluntary self-identification is one way of obtaining this information from the front end. Be sure to outline why you are requesting the information and how it will be used. 2. Add a diversity and inclusion section to each of your staff /leadership meetings. Injecting awareness and instructional information into your workplace on a regular basis is a significant reminder, diversity and inclusion is an integral part of your operations. It is not an add-on but just as crucial as health and safety awareness. 3. Ask your generation Y (Millennials) for their opinion. Seems strange? Not really! They are dying to hear from you. These workers have had diversity as a natural part of their landscape. They have expertise and want to be acknowledged for their opinions. Find out what they think you could do to make the workplace better and ask them to help out with building a strategy. Each week send a handwritten thank you note to an employee recognizing their work. How long does it take? The busiest person on the planet has two minutes to thank an employee. Isn’t a good employee worth the time? Your recognition will go a long way with boosting morale. 5. Inform all staff about professional development and promotional opportunities. You are probably thinking we do that already so what’s the big deal? Consistently, research points to the fact that visible minorities, women and immigrants are often left out of the loop when it comes to growing and developing in the organization. Workplace equity begins with giving everyone the same information and organizational opportunities. Motivated to learn more about workplace inclusion? The No-Nonsense Guide to Workplace Inclusion can show you how to do it. Endorsed by business management schools and diversity practitioners, it’s all you really need. 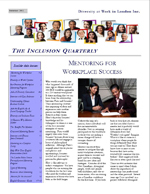 Visit http://www.yourdiversityatwork.com/ebook/ to preview and purchase. 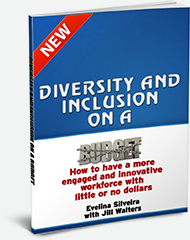 An excerpt from Diversity and Inclusion on a Budget: How to have a more engaged and innovative workforce with little or no dollars written by Evelina Silveira and Jill Walters. Let hard-to-reach groups know that there’s an opportunity for employment with your organization by showcasing a broad spectrum of employees in your company literature and on your website. Let your employees know what your goals are in terms of a representative workforce, and that you value their suggestions and help. Ask if they would be willing to share their history with the company. This is a great way to demonstrate that you can be an employer of choice for diverse applicants. The employees that you include in your staff literature and on your website should represent a cross-section of departments and available positions. If you are confused as to where to begin, bank websites are really great at creating an employer brand, specifically the Royal Bank of Canada (www.rbc.com). Include employees who have held a number of positions within the organization and have advanced through the company. This demonstrates that there is equal opportunity for all. Note any committee involvement, special assignments, skills or expertise they have acquired as a result of working for your company. These mini-profiles, highlighted on your website and in your literature, go a long way in promoting your company’s image as an employer of choice. Brag about it! Don’t hold back and be humble! Remember, labour shortages are starting to occur in many sectors. Stand out and let it be known who you are as a company, and what employees can expect from working for you. It’s probably an odd analogy but think about your company as a potential date. If your company was on the dating scene, what attractive qualities would it promote? What could it offer? Why should a job seeker be interested in you? What could it gain from having you as an employee? With this in mind, think about all the areas in which your company supports its employees, and include those details on your site. For instance, younger workers are really keen about seeking out employment with companies that are socially responsible, environmentally friendly, flexible and interactive. Having a pool table might be a bonus. Include this information! Do you have an on-site day care? Flex-time opportunities? Cross-training? A mentoring program? Employee Resource Groups? Prayer rooms? Adaptive technology? A women’s leadership group? On-site smudging area? Gym? Pool table? English as a Second Language classes? Pets at work? All these programs and services demonstrate that an employer supports and cares about the employees; their physical, social, spiritual and psychological well-being, and their need to succeed professionally. List them! Consider asking those employees with more seniority about the special perks and selling points of working at your organization. Include them on your on your promotional materials as well. Evelina Silveira, President, Diversity At Work in London Inc. Author of Diversity and Inclusion On A Budget: How to have a more engaged and innovative workforce with little or no dollars. Hey there, Evelina!”, the e-mail salutation reads. Do I know this person? It seems that they must know me, right? Because they are so familiar? Nope. I never met them in my life! Probably a Generation Y’er I figure, who is sending me this in their casual and unassuming way. Born during 1981- 2000, Generation Y’s unique characteristics have stirred up a lot of turmoil in the workplace especially when it comes to their Baby Boomer bosses and co-workers. Whether it’s their tattoos, piercings, flip-flops, self-care or their need to be wired, connected and informed — the workplace will never be the same. Sorry Boomers! Laden with labels like: “disloyal”, “uncommitted”, “self- serving”, “techno-savvy”, “fun-seeking”, “lazy”, and “immature”; these children of Baby Boomers have experienced more freedom, less responsibility, little in the way of criticism, and some would argue too much praise. Consequently, employers complain that they don’t take work seriously, can’t handle criticism and feel they are entitled to privileges and rewards that others do not get and that they do not deserve. The disconnect begins here. After all, how do we get four generations to work together for the first time? As a Generation X’er, I understand the harsh criticism bestowed upon Generation Y’ers; but at the same time I think that our generation understands them better than the Boomers. Generation X’ers were the first generation to dispel the myth that getting a university education will automatically land you a “good job”. We were working in call centres, as clerks and service jobs with our university degrees when the first recession hit in the 1980’s. But Generation X’ers approach to this phenomenon was a little bit different. Because of fewer jobs, our “latch key” socialization meant that we looked for solutions within ourselves. We decided to make our own jobs, creating the largest generation of entrepreneurs ever. Generation Y’s solution to the shift in the economy is different. Strategically, Generation Y put their cards on the table right at the beginning with their prospective employers letting them know what they need from them, instead of what they can offer. Taking a completely different approach from previous generations, the Generation Y’er can come across as self-serving. That is where some of the conflict and misunderstanding begins along with many other disconnects in workplace values. I am not a big fan of theories of generational differences although I believe there are some merits to the observations about various age groups but I don’t think they are absolute. I strongly believe that social class, birth order, and cultural differences play larger roles than age. The research in this area is arguably centred around privileged white youth who live in the suburbs, so it could be unrepresentative. Despite the criticism lodged against Generation Y’ers, when it comes to diversity they really get it. Parented by those who lived through civil, women, and gay rights movements, Generation Y’ers have had a strong initiation into equality. Attending inclusive schools with children who have disabilities, exposure to more cultural and racial differences as well as a variety of family compositions: this generation is more socially and environmentally aware. Of all the generations, they will have more of a propensity toward social justice and want to know the impact of their work. rapidly changing diverse world —it is natural to them and they embrace it. So, before you reprimand your Generation Y’er for not wanting to work overtime hours for free: relax; let your hair down; plug in your iPod and put on a pair of your favourite flip-flops and recognize the positive attributes of this deeply misunderstood generation.